This past October, a rare snowstorm clobbered the east coast, and my husband and I were without power for six days. To say it was an inconvenience is an understatement. During this time, we relied on our iPhones to figure out where to get heat, power, and food, and we sent messages out on Facebook and Twitter to let friends and family know we were alright. Facebook and Twitter also became our lifelines to the small businesses in our area that shared information on who was open and where we could go in the aftermath. It was how we found out that one of our gym’s two locations had power — we could sweat out our stress and use their showers — and that some local businesses were letting people come in just to use their outlets to charge their phones and laptops. 1. Be an information source: During Hurricane Irene in August and the October snowstorm, Dining Out in Central Mass, an organization that promotes local restaurants in Central Massachusetts, did an amazing job of letting people know what restaurants and other local businesses were open as power was being restored to the towns. As people recovered from the snowstorm, DOCM posted on its Facebook Page frequently, passed along information from local police departments, and encouraged other restaurants and fans to provide their own updates. 2. Use the weather to get people in the door: Belleville Farmers Market in Belleville, Ill., loves to create promotions based on what’s happening outside and share them through Facebook and email. A balmy winter day recently was a good time to promote their Christmas tree selection. And it's not just wintertime that works for weather-based marketing; when there’s a summer heat wave, the Farmers Market promoted its air conditioned store and fresh corn. 3. Create a contest: During one of New England’s recent epic snowstorms, Boloco came up with a snowball challenge and promoted it on Facebook and Twitter. Customers who brought in a snowball of significant size earned themselves a buy-one-get-one-free menu item. 4. 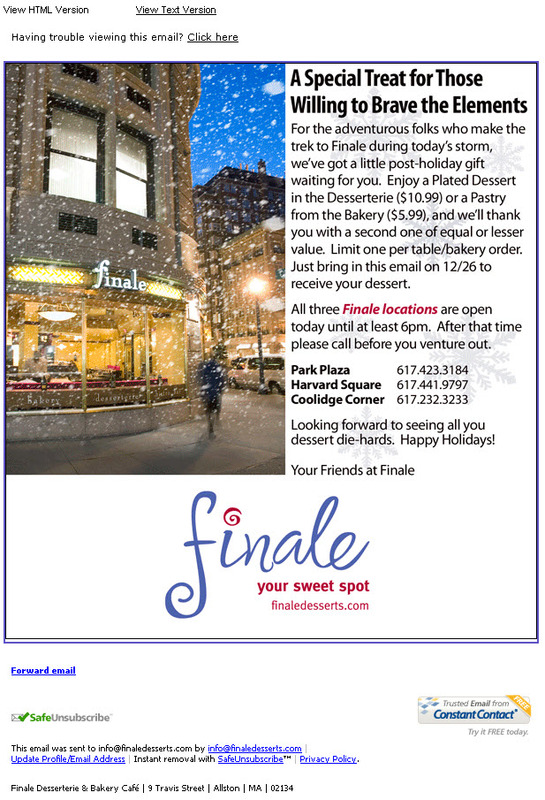 Give an incentive during the weather event: One snowy day last winter, Finale Desserterie & Bakery invited customers to relax from snow shoveling with free hot chocolate when they bought a dessert. On another day, it offered a free dessert when you bought one. 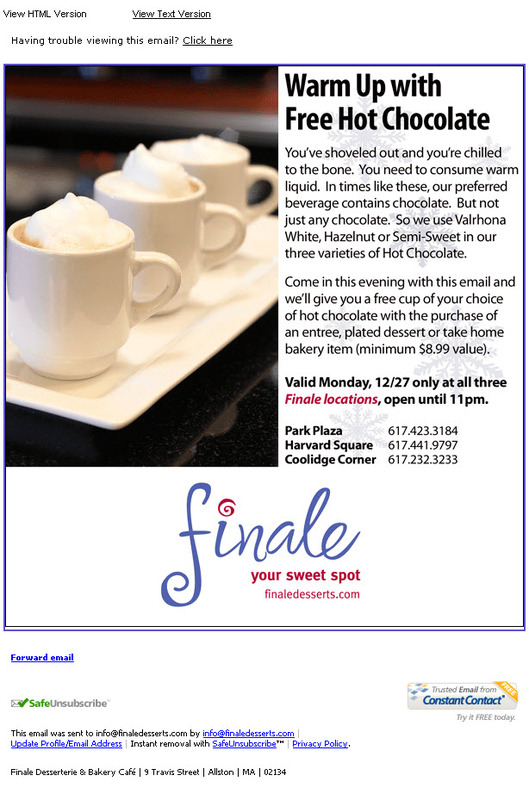 Both offers were only good for one day, so they gave chilly customers an incentive to bundle up and grab a treat. Your customers love talking about the weather, and as winter settles in across the country, chances are good they'll have plenty more to talk about. So talk about it in your promotions too — and provide customers with the perfect excuse to get out and visit you. 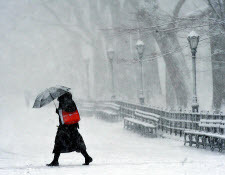 Do you take advantage of the weather in your marketing efforts? I'd love to see an example. Share your thoughts (or campaigns) here or on our Facebook Page.